Details: Just in time to catch up with the AMC drama before its third season premiere on March 21 (10PM ET), season two hits DVD with the performances that won star Bryan Cranston a well-deserved best actor Emmy, and co-star Aaron Paul an equally well-deserved best supporting actor nomination. Cranston plays Walt White, the schlubby high school chemistry teacher whose entire life spins out of control when he finds out he has cancer and decides to cook up drugs to sell and secure his family’s financial future, with former student (and current drug user/dealer) Jesse (Paul) assisting him. Without spoiling it for those who haven’t watched yet, season two is filled with danger, action, dark humor, tragedy and drama after drama, as Walt gets deeper and deeper into the drug world, all while trying to keep his side business a secret from wife Skyler and battle his cancer. Jesse also has personal problems, namely his growing addiction and his estranged family, and the drug partners’ problems combine and lead to crushing consequences for those around them. 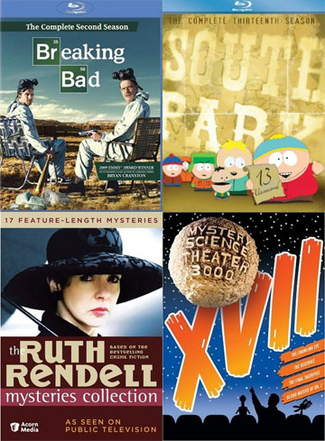 Consider Breaking Bad in the top five of shows worth marathon-ing on DVD if you haven’t already (especially since the Blu-ray version of season one was also released this week). Bonus Features: An interactive “writers lab” guide that’s exclusive to the Blu-ray release, a photo gallery from series creator Vince Gilligan, deleted scenes, cast and crew audio commentaries, a gag reel, Breaking Bad Webisodes, the “Better Call Saul” commercial for Bob Odenkirk‘s slimy attorney character, featurettes on each of season two’s 13 episodes and a sneak peek at season three. Details: This massive collection – 11 discs, with 17 stories – is chock-full of British TV adaptations of crime author Rendell‘s stories, starring celebs like George Baker as Inspector Wexford, Battlestar Galactica‘s James Callis and recent Oscar nominee Colin Firth. I said, Colin Firth … need more reasons to sample the sharply-written, well-acted mysteries? The set includes the following gems: Master of the Moor, Vanity Dies Hard, The Secret House of Death, The Double, Bribery & Corruption, Front Seat, A Case of Coincidence, A Dark Blue Perfume, May & June, The Orchard Walls, Going Wrong, Harm Done, The Fallen Curtain, The Lake of Darkness, You Can’t Be Too Careful, Simisola and Road Rage. Bonus Features: Super Sleuths: Inspector Wexford, a Rendell Mysteries documentary starring George Baker; a biography of Rendell and filmographies of the cast. Details: From poking fun at the Jonas Bros. in “The Ring” and poking fun at Kanye West and Carlos “Menstealia” in “Fishsticks” to Cartman’s love of Chipotlaway and Butters accidentally becoming a pimp, season 13 included several classics from the South Park fellas. Oh, and, “Dancing With Smurfs”! They were totally right about Avatar. Details: Episodes in which Joel, Mike, Crow, Tom Servo and Gypsy riff on The Crawling Eye, The Beatniks, The Final Sacrifice and Blood Waters of Dr. Z make their DVD debuts in another great Shout! Factory set. Bonus Features: A new Q+A with The Final Sacrifice star Bruce J. Mitchell, original trailers and promos, photo gallery for Blood Waters of Dr. Z and a featurette on Crow vs. Crow from Dragon*Con 2009. Details: All 10 episodes from the History Channel show’s premiere season on ancient gods and monsters includes installments on Zeus, Hercules, Medusa, Minotaur, Thor and Odysseus. TV Screener Tidbit: The official Web site for the series includes video clips from each episode if you want a little preview. Details: The big remake is set for CBS’ fall schedule, so there’s no better time to catch up with the Jack Lord original Hawaiian cop drama. TV Screener Tidbit: Season eight guest stars included Bruce Boxleitner, George Takei and Ed Asner. Details: The OCD detective sailed off into the sunset at the end of this terrific season, which found him finally solving the mystery of his wife’s murder. The show’s series finale episode last December even set a new record as the most-watched episode of a cable TV drama, with 9.4 million viewers tuning in. Bonus Features: Set tour, video commentary, cast and crew interviews and a “Mr. Monk Says Goodbye” featurette. Details: So much to love about this cheesy, but fun, high-concept sitcom, in which Greg Evigan and Paul Reiser raise a teenager after her mother dies. Season two is most notable for its Night Court crossover, with a guest appearance by Richard “Bull Shannon” Moll, and appearances by then-child star Giovanni Ribisi, who was credited as Vonni Ribisi. TV Screener Tidbit: Season two also featured a rock-ier redo of the show’s infectious theme song, “You Can Count on Me,” written and performed by series star Evigan.